For the first time since 1999-2000, the Liberal Lady Redskins have won back to back WAC titles. The Lady Red took care of Garden City 49-25 on senior night in the Big House Tuesday night. 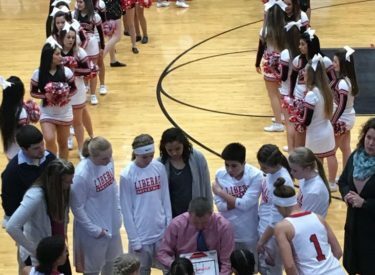 Liberal can clinch the WAC crown outright with a win at Dodge City Thursday or a Hays loss at Great Bend. The Lady Skins led 9-5 after one quarter but ballooned the lead to 27-9 at the half with an 18-4 run in the second quarter. LHS led 42-17 after three and led 49-17 early in the fourth quarter. Machia Mullens had 15 points and eight rebounds to go with four blocked shots. Katie Horyna had 13 points. Audrey Gilmore dropped in eight. The Lady Redskins made 4-11 three pointers and Garden City was 1-11. LHS was 12-13 at the foul line. Liberal head coach Carter Kruger is 6-0 against Garden City. The Lady Redskins are 18-1 and 6-1 in the WAC while the Lady Buffaloes are 6-14 and finish 2-6 in the WAC. LHS plays Dodge City at the Dodge City Fieldhouse Thursday at 6 with Redskin Pre-game at 5:45 on 1270 and kscbnews.net.